Father’s Day is a day where we get to thank all the wonderful men in our lives like our husbands, fathers, and brothers for being the wonderful dads that they are. Even though I am working on rebuilding my relationship with my dad I am thankful for all the things that he has taught me, like how to tie good sturdy knots, and exposing me to things like rafting down class four rapids. One of the main things I learned from my dad was the love of the outdoors. Since much of my time spent with my dad was outside I easily fell in love with outdoor cooking. So when I started thinking about a Father’s Day, menu I immediately started thinking about delicious foods that I used to cook with my dad on the grill and eat in his screened in back porch overlooking the river. If you also think of Father’s Day as a day to be outside, cooking delicious foods over a flame, then this menu is for you. When you think of grilled food, I often think of grilled meats, not anything super healthy or packing a lot of nutrients. But believe it or not, there are some delicious healthy grilling dishes out there waiting to be cooked up for a delicious Father’s day. If you buy your corn with husks, then remove the husks and silk like strings. Then simply lightly rub butter all over the corn, as little or as much as you prefer. Then sprinkle with salt and pepper. Next wrap the corn individually in aluminum foil. Cook for 15-20 minutes over low to medium heat or until tender. This is a great and fun way to get some color and up the nutrition level of your grilling repertoire. 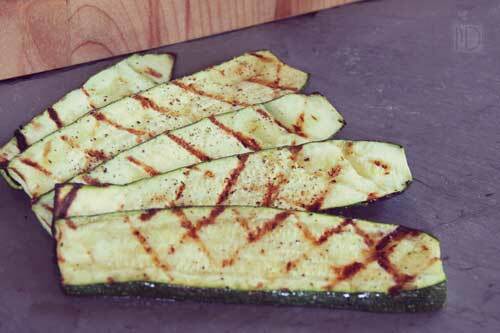 My favorite grilled veggies are zucchini and bell peppers. I always have some around ready to throw into several of my favorite dishes. Another way to cook veggies is by cutting them into cubes and putting them on a skewer for easy-to-eat treats. The best way to grill any meat is to keep the marinades simple. My favorite grilled meats only include salt and pepper, possibly olive oil and lemon. These are my go-to marinades/seasonings. I feel like when you keep it simple you really get to taste the meat you are cooking. If you want a different taste you can always add different spices for different flavors. 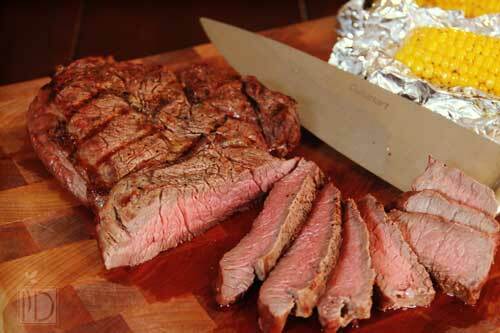 If you are cutting down on your meat intake then try getting one nice piece of steak like a sirloin, cooking to your liking and then slicing it up to serve. A few slices on your plate mean that you will eat less meat like you wanted and can load up on other things like vegetables and fruit. Yep you can also fix deserts on the grill. The taste of grilled peaches is something that just makes me think of summer fun with family and friends. Kimberly contributed this recipe using peaches, one of the season’s most delicious fruits. It will help keep you cool this summer. I was lucky and actually got to try this recipe out on my dad. It’s not quite Father’s Day, but this made a refreshing, easy, weekday dessert. I made two versions, one true to Martha Stewart’s instructions, and one without sugar. I was surprised that the one with sugar was much creamier than the one with no sugar, though both tasted great. I’ve been substituting coconut sugar in all of my recipes lately, but I went ahead and used white sugar in this one because I didn’t want to compromise the color. We used frozen peaches that my parents picked from their tree last year. This is a great option if you want to make ice cream but don’t have an ice cream maker. Remove peaches from freezer, separating with a knife or kitchen shears if necessary. Combine sugar (if using) water, lemon juice, and salt in the bowl of a food processor. Add peaches. Process until smooth, intermittently stirring as necessary. Pour into a loaf pan, smoothing out the top with a spoon. Cover tightly and freeze for up to three days. Scoop and enjoy immediately. Also pairs nicely with berries or melon. What dishes will you be sharing with your dad or husband this father’s day? Share your recipes in the comments below.